I'm finally moved in here in Santa Ana. Not entirely settled yet -- there are still a number of boxes to be unpacked, and possibly a bit of furniture rearranging to be done before I get an arrangement that's entirely pleasing to my eye -- but at least everything is down here. 1825 Greenfield Avenue is entirely cleaned out and vacated; Al & I moved the last boxes out of the garage on Saturday. (There were painters in the house, doing what they said was the cheapest job of repainting they'd ever been hired to do.) Unless I have to go out there to pick up any mail, I may never see the place again. Well, maybe a special trip out to photograph it someday; there are still no pictures of it for fannish posterity. I say that I might have to go out to pick up the mail there still, because the local post office isn't very good at forwarding mail. The last week's mail, which the next-door-neighbor had kindly kept for me during the week, contained material for Al Lewis and Jerry Jacks, both of whom filed changes-of-address long ago. All the other fen who've ever lived there continue to get mail from time to time, too -- usually circular junk mail, but some first-class letters besides. That's why I didn't file my change of address until last weekend, so that as few items as possible would have a chance to get lost in rerouting. Most of fandom has my new address, though apparently fen just won't believe that 1825 Greenfield Avenue is no more; the batch of mail I picked up there last weekend contained fanzines from three fen who all have my new address -- two of them even listed my new address in the zines sent to my old address! This is Cosmic thinking? Anyhow, my old next-door-neighbor has very nicely agreed to take in any mail for me that continues to be delivered there, for awhile, and I'll pick it up every couple of weeks or so, so hopefully I won't miss anything. 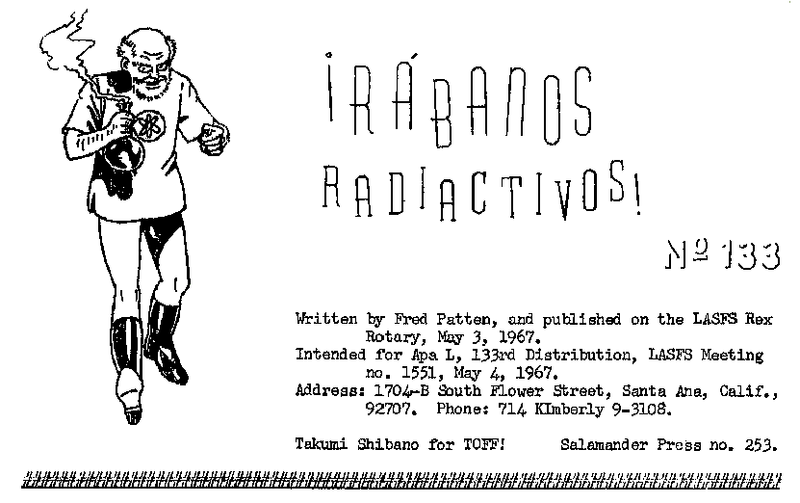 To change the subject, the 2nd issue of WITZEND, Wally Wood's comic-art semi-pro fanzine, is out, and it's well worth the $1 asked for it, if only to encourage Wood to keep publishing it. Those of you who've been raving over George Barr's adaptation of The Broken Sword in TRUMPET will be particularly interested in the beginning of a new sword-&-sorcery series created entirely by Gray Morrow, who seems to be able to write his own material even better than he draws it. Mike McInerney is on the zine's editorial staff, I note. I got my copy at the Collector's Book Store, which stocks it; go thou and do likewise. Dian Pelz -- Sure, I'm willing to photostencil any art that you care to do for "Prince Morganstern" for The Best from APA L; I'll be glad to get something so intricate that it can't be hand-stencilled. As I mentioned earlier, this year's Best looks as though it's not going to have much good artwork -- rather, I should say, much diversity of artwork. Most of it will be yours, Nothing by Bĵo or Harness, I don't think; maybe one or two pieces by Simpson; nothing by Chambers or Porter... I guess Schu will probably have the biggest amount next to you, provided I can get the masters and stencils to run it. Felice Rolfe -- As long as we inspire you to keep contributing to Apa L, I'm happy. I have a feeling that no other "Star Trek" parody is likely to be as good as the pastiche Ruth Berman did for FAPA recently, but I'd still like to see yours. Don't put it on too soon, though; you know we're preparing "Gilbert & Sullivan Meet Captain Future" for the WesterCon, and we don't want you stealing our thunder. Bruce Pelz -- Even though I abhor blank backsides, I don't think that printing on the backs of the LASFS Sign-up Sheets is a good idea. They're faint enough as it is without something on the other side of the page to show through and detract from the legibility still further. ## I suppose the next material to be itemized on the list of LASFS Records is the holdings of the LASFS Library, but I hesitate to get involved with that at the moment. In the first place, I don't have all of the Library, so such a list couldn't be complete. In the second, I suspect that not everything in the part of the Library that I have is a proper part of the Library (like the Army Officer's Manual, Goodbye, Mr. Chips, several READERS DIGEST best-seller condensations, various religious books, and the like); or if they are officially in the Library, they should probably be discarded as impertinent. In the third, are the LASFS Archives a part of the Library? And, if so, how do we list various loose scraps of old records? In the fourth, what about old fanzines & prozines, some of which are so decrepit that they should probably be tossed out rather than saved. (Remember, even the last remaining stuffed Dodo had to be thrown out eventually, because it got so moth-ridden that not even the British Museum could save it.) In the fifth, what about "fantasy" ephemera such as Technocratic, American Nazi, or Esperanto magazines, or movie magazines with articles on Robert Vaughn? A housecleaning, rather than an Official Listing, might be in order for some of this junk. Tom Digby -- Yes, Andy Porter did a dittoed cover for Apa L #75. Dwain Kaiser got one from Lynn Pederson for Dist'n #79 or thereabouts, and that was the last dittoed cover we had until Schu and Terry came up with those two recently. Earlier we had some very nice ones by Bĵo back around the beginning of the group, but that was a long time ago. From about #90 until I resigned the OC-ship, I was able to get almost no original cover art -- only used stencils to be rerun on the mimeo. Original ditto covers, after all this time, are very welcome, even if there haven't been any outstanding ones yet. Don Fitch -- I'd rather have Expeditions on Saturdays myself, because fen are too tired after long parties on Saturday nights to go out on Sundays. Unfortunately, Bruce has Saturdays so booked up that we'll have to ask people to miss some of his affairs, if they want to get into our program. I'm beginning to wonder if it wouldn't be wiser to wait until after the WorldCon to inaugurate this program? Hopefully, there'll be at least a couple of cultural jaunts before then, tough. Lon Atkins -- I hope you're kidding about the lack of necessity for a good LASFS Fan Directory. For one thing -- and probably the most important -- it's handy to have all the names together, where you can read 'em in a minute, without having to look through bulky phonebooks or maybe the last two months' worth of Apa L to find them. That alone would justify the Directory.